Another new three cent coin was authorized in 1865, this one composed of 75% copper and 25% nickel. Its purpose was to replace the non-circulating three cent silver coin and the three cent fractional currency note. Unfortunately, the Three Cent Nickel was not assimilated into society as hoped. The mintage in 1865 was 11.4 million, but declined sharply thereafter. From 1879 until its final year in 1889, quantities numbered just a few thousand annually. When considering the business strike version, the 1884 is a very significant key date in the Three Cent Nickel series. Only 1700 were struck, less than half of the 3942 proof issues of the same date. Apparently, 19th century collectors had little interest in setting aside new business strike examples of the 1884 Three Cent Nickel. Their numbers in higher grades are microscopic, as evidenced by their very hefty price tags. Indeed, the survivorship rate overall for this date is comparatively low, so any authentic example of this diminutive coin is a highly prized acquisition. 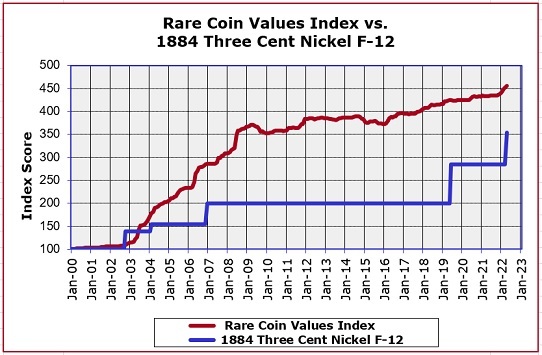 The blue line above shows the percent gain of the 1884 Three Cent Nickel in F-12 condition since the Year 2000. The red line is the percent gain over the same period of time forour Rare Coin Values Index, which is the composite performance of a group of 87 key date coins chosen to represent the overall direction of US rare coins. The 1884 Three Cent Nickel certainly qualifies as a rare coin, but it does not rate as well as most of the other coins in the Index.New data is added to the Index every month.